The Christopher Ward C8 Regulator Limited Edition is the latest pilot's watch from the English/Swiss hybrid brand. Christopher Ward seems to be on a roll at the moment. They are re-designing old watches, releasing new ones and they continue to knock most Swiss brands into a cocked hat when it comes to ecommerce and pricing. Earlier this year they released the C8 Regulator, a limited edition pilot's watch with an unusual layout and an all-black design. The name regulator was first used to describe timepieces in the 18th Century, specifically clocks with a weight driven movement and a deadbeat escapement. Watchmakers began using these clocks to regulate their timepieces but they changed the layout as they believed that it was easier to read the dial when the hour, minute and seconds hands were separated into individual dials. Over time this style of dial became known as 'regulator'. The blurb on the Christopher Ward site says that "World War II bomber crews would use watches like this to time the manual release of their payloads". There were wrist and thigh worn regulator layout chronographs that were worn/strapped to bomb operators but this style of chronograph was uncommon. 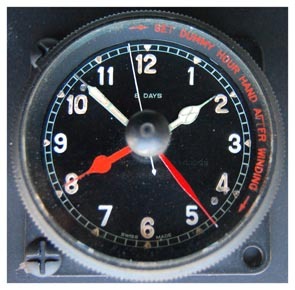 The timepieces used more often by pilots were of normal dial layout with the most common variation being the size of the piece. The Christopher Ward C8 Regulator, like other watches in their aviation line, is inspired by the Smiths Mark II clock found in Spitfire cockpits. The Smiths Mark II valued legibility above all else and reduced glare from sunlight by painting the case and dial black. The numbers and hands were painted with tritium for maximum visibility at night. An extra pair of hands known as 'dummy hands' were painted red for easy distinction. These hands were unconnected to the movement but were adjusted manually by the pilot to calculate flight time whilst in the air. The Mark II was not a regulator and has the standard layout whereby all the hands are located on the central pinion. (There are other Marks which have a flight time recorder at 12 o'clock but the main hands were still located in the center of the dial). The design of the C8 Regulator is an amalgamation. a horological contrivance. Through a modern lens, the C8 Regulator views the rare regulator chronographs of World War II and the Smiths Mark II clock. Whilst the Smiths had large arabic numerals, the C8 has stick markers cut into the dial, except for the applied markers at 3 and 9. Despite their smaller size, they do a marvelous job at standing out against the matte black dial. These markers, along with the hour sub-dial at 12 o'clock, are stenciled out of the dial to reveal the lumed section underneath. The effect is more pronounced on the hour sub-dial which itself is recessed into the dial as well. The running seconds of the watch at 6 o'clock is also recessed. The problem with regulator watches and clocks is that they are unusual. For centuries the norm for timepieces is to have the minute and hour hands located in the center of the dial. There is no evolutionary obligation to looking at the center of a dial, it's something we're taught as child but it's a powerful cultural reinforcement so the layout of the hands is at odds with your expectations. Second and third glances filled my first few days with the regulator as I learned to look up on the dial for the hours. The more I wore it the easier reading the time got, but it still feels unnatural. This is not a phenomenon unique to the Christopher Ward by any means but something that all regulator watches have to face. The two registers at 12 and 6 provide a strong vertical line of symmetry down the dial and the 'Christopher Ward' and 'Regulator' text at 3 and 9 provide a softer, more traditional form of balance. The logo looks good on the C8 though I'm still unconvinced by Christopher Ward's decision to place it at 9 o'clock on all their watches. This watch, like the C60 Trident Pro and the C8 Worldtimer, has a diamond like coating (DLC) covering the entire case and crown. Black cases are a contentious subject in the watch community but Christopher Ward's use of the aesthetic has been good. All the DLC watches of theirs that I've worn have been tool watches. The high contrast provided by the coating looks good and works well in these types of watches. At 44mm the case is larger than I'd like but given the aviation inspiration I can forgive an extra few millimeters as period pilot's watches would have seen gigantic at the time; now they seem positively quaint compared to modern pilot's watches. The long lugs on the watch do make it wear a few millimeters larger but it's not a world ending amount of distance. Inside the watch is a Unitas 6498 hand-wound movement with modifications by Christopher Ward's chief watchmaker, Johannes Jahnke. The Unitas was first made in the 1950s as a pocket watch movement, which shows you how large wristwatches have gotten in the last 67 years! It has a slow oscillation of only 18,000 bph and an below average power reserve of 46 hours. The architecture of the movement is interesting as the two large plates that cover the movement push your attention onto the large balance wheel to the side. The movement is finished with Cotes de Geneve, and Christopher Ward further customized the aesthetics with their name atop the main rachet wheel. It's a simple yet effective decoration so it's a shame it's hidden underneath the smoked crystal. In Vlog #010, I said that I was confused by the decision to use smoked sapphire crystal for the case back. Two weeks later and I'm still a bit confused. The only other watch I've seen use smoked crystal is a limited edition TAG Heuer Carrera 1887 in partnership with SpaceX and I didn't get it then and I don't get it now. Christopher Ward told me that their decision to use smoked crystal was so they could continue the theme of an all-black pilots watch, right down to the crystal. Their theory was that if you looked at the case back on an all-black watch and saw a shiney movement glaring back at you, it would out of place. Whilst I understand and applaud their decision from an artistic perspective, it just doesn't make sense to me on a personal level. Why decorate the movement only to partially cover up it? Please note that all the photographs you see here of the movement are taken under two lights with a slow exposure with a remote shutter button with the camera mounted on a tripod. Getting a well lit shot of the movement without that equipment would have been a bit of a struggle. Of course the smoked crystal doesn't affect the quality of the movement, it just makes it harder to see. The C8 Regulator is available on 3 different colored 22mm straps; black, camel brown (pictured) and a dark tiber brown. The strap was comfortable though it was too chunky near the lugs for my taste. Much like the C8 Worldtimer, the Regulator would look good on a NATO strap and thanks to the quick change spring bars, swapping straps would be a painless process. I have yet to figure out why more companies don't offer quick change spring bars as standard, surely that extra spring and metal bit won't affect the bottom line too much? It's little things like having quick change straps that continue to impress me about Christopher Ward. Something that I'll continue to praise Christopher Ward for is their pricing. Whether you want to go out and buy the C8 is your own business but you must admire Christopher Ward for sensible pricing. At $1540, the C8 Regulator is exceptionally well priced for the quality of the watch and the uniqueness of the design. If you're looking for World War II heritage inspired regulator then your only other option is a Bell & Ross 2012 which will set you back over 4 times as much. If you're in the market for an interesting interpretation of a military pilot watch then you should consider the Christopher Ward C8 Regulator Limited Edition. The unique design does get some getting used too but after a few days, I found the all-black look and regulator layout quite endearing. If you're turned off by the regulator dial then you may want to look at the C8 WorldTimer for a more conventional take on a modern pilot's watch. There are only 100 C8 Regulators available so if you're interested, you better fly out and grab one before you're too late.